A couple of months ago, I decided to discontinue my blog. Some of you have asked me why. There were several reasons. The main reason was related to what I would qualify as blog stalking. From now on, I will give less information about me in order to protect my privacy. I also needed a break, the mental pressure of having to publish something smart every couple of weeks, while working 11 hours a day, traveling all the time and having to raise a family, was a little bit too much. I needed some time without that pressure. However I am coming back with a new blog catalonianpolitician.blogspot.com . I am not sure which language I am going to use yet. As you probably know I am a Catalan nationalist who defends Catalonia without blaming Spain for where we are. I like Spain and the Spaniards. They would make excellent neighbors. I want to influence the Catalan society towards nationalism/globalism, not towards localism. I want every Catalan to be fluent in Catalan, Spanish and English, proud of our mother tongue, Catalan, but conscious of its limited reach. The problem is that English level in Catalonia is pathetic. Should I write in Catalan? Should I write in Spanish? Should I stick to English? I am discontinuing this blog. I would like to thank all those who visited and commented during the last 2 years. I will continue to visit yours. While in Shanghai this week, I continued to keep in touch, as usual, with what happens in my dear Catalonia. I read in e-noticies a piece of news that described the policies of the telecommunication company Jazztel. Apparently this company only accepts communications in Spanish even though is sells products and services in the Catalan speaking territories of Spain where Catalan is the official language.I am not surprised that Jazztel tries to get away with it. Companies hate diversity, “one size fits all” is the best methodology to reduce cost. Customization and localization cost money even if you have embedded DFD (design for diversity) in your design process. But market forces are able to counterbalance the natural tendency of companies to avoid diversity. My biggest issue is the reaction of some people to Jazztel arrogant position. The worst attitude is the ‘botifleristic” approach. One guy was saying, if by having Catalan customer service I will have to pay more, forget about it. These are the kind of people who have made us lose all battles since the Trastamaras, people who would not move a finger to support their country and that would sell it for personal gain, like Mas with the Estatut (Catalan Constitution), like Carod-Rovira and Montilla with TV3 in Valencia and so on. Let me tell you, if the vast majority of Catalans wanted products and services in Catalan we would have them, the applicable techniques: solidarity, perseveration and market economy. Let me explain you how this would work for Jazztel. All Catalans or at least the 60%-70% who care about their language, should stop using Jazztel and switch to a carrier where service is offered in Catalan (preferably in Catalan, Spanish and English, my trilingual dream), even if it is more expensive. After a few weeks, the market share of Jazztel in Catalonia, the most affluent area in the country, would be so low that they would put together a taskforce to try to reverse the trend. After analyzing the exit interviews, they would conclude that the solution was an aggressive marketing campaign in Catalan with attractive prices and the set-up of a call center in Catalonia to serve the customers in Catalan.In order to maintain the margins in Spain, they would be forced to go for a second round of outsourcing and move more jobs from Spain to Argentina. A few months ago, Jazztel shut down the call center in Galicia and moved it to Argentina (que bueno que chamaste), read it here and here. Conclusion, in a few months, we would have Jazztel in Catalan, we would have created jobs in Catalonia (pretty difficult to outsource, maybe to Valencia, Andorra or L’Alguer) and it would have cost us close to nothing. In a larger scale, the solution is even easier. Let’s assume that we declare the months of October 2007 and February 2008 as the months of Catalan in labeling and services with the support of all society, consumer associations, political parties (except PP), etc. It should be a non political exercise, not a boycott, but an exercise of consumer preferences. During the month of October, only products and services that would offer labeling and customer support also in Catalan (I am not saying only in Catalan) would be chosen. We may suffer a little bit, we may have to pay more for some products, we may even have to narrow our selection, maybe have only lettuce and onions for a couple of days, but it will be worth while. In November, after having given our warning signal, we would go back to our normal consumption habits, while all the companies that got the message would start to address the Catalan market seriously developing labeling, graphic interfaces, directions for use and service centers in Catalan. When in February, the campaign would reinitiate, the choice of products would be much wider, the price differential insignificant and those manufacturers who chose to ignore the customer requirement would be definitely out of the Catalan landscape. There is only one aspect that worries me and it is collusion. I have the feeling that it already exists today and we need to bring it to the open. I am afraid that many companies have agreed on certain rules of the game to avoid that one of them goes full speed with Catalan and the others are forced to follow. The solution is called “whistleblower”, someone needs to produce an internal document or trail of emails to prove it and the justice system will do its job. Collusion and price fixing are illegal practices. Note: The videoclip is an edited version of an original Motorola ad. The company SardanaTel only exists in my imagination, maybe now in yours too. Last Friday night I left for China. I had a couple of important meetings in Suzhou on Monday morning and my assistant was not able to get me a confirmed ticket flying west, so I had to fly east, although it meant a very long layover in Germany. Those who have followed me for a while, will remember that I swore not to fly Lufthansa anymore (Lufthansa nie mehr! ), but this time I had no choice. The way to China was long, but I slept a lot, both in the plane where the business class seats recline to almost flat position and in the lounge where they have a special area with dimmed lights and reclining chairs. The stewardesses continued to be rude, but bearable and Lufthansa has really good planes and safety is first. During the last 18 to 24 months flights to Asia have always been packed, all of them overbooked and with the risk that if you would not make the connection due to weather, they would send you to Anchorage and Narita prior to getting to your Chinese destination. In the plane I watched a couple of movies. I started with a drama called Blood Diamond with Leonardo di Caprio, but I was not in the mood to see people suffer, so when they started to slaughter little kids I stopped it and decided to go for a comedy. I chose a Cantonese movie called Ngor yiu sing ming (My name is fame). I watched it in Cantonese with English and German subtitles. A nice movie with good actors, especially the very charming actress Huo Si Yan (or Fok See Yin in Cantonese) and I noticed that I understand more Cantonese than I thought. Remind me and in a couple of weeks I will talk about the trilingual territory of Hong Kong. I did the return in First class, apparently business was full according to my assistant. I never check the itinerary before I leave. I open the folder upon arrival and all the required information is always there, including the cell phone of the driver that will pick me up in those countries where renting a car is either not possible or not advisable. From Shanghai I called the travel agency to try to downgrade me to business but they told me it would cost me 1000 dollars. I try to always be cost conscious and business class is good enough, despite the angry stewardesses. So I resigned myself to take First Class on the way back and surprise, surprise, stewardesses were friendly, you get a 100% flat bed, a pajamas and a sweater, caviar, Jabugo and all that jazz. The return was not through Frankfurt, but through Munich. I hate Frankfurt, it is a lousy airport, but Munich is great. Germany has been able to create a double hub, something that Spain opposes, but Bavaria, the strongest Bundesland demanded to Lufthansa the creation of an international hub in its capital and Lufthansa did. Actually the airport is by far better than Frankfurt’s. Those of you readers living in the Jacobine country of Spain will know that the army is there to protect its unity and a citizen who challenges that principle can become a target for the army. The Spanish constitution legislates, in an implicit way, that those Spanish citizens who challenge the unity of Spain can be lawfully executed and the core conservatives consider that an international hub in Barcelona would be the first step towards a breakaway. Months before the whole fuzz about the Barcelona hub started, I wrote about it in my blog (click here if you want to re-read it) and I advised the Catalonia government to lure a foreign airline to set up its European hub in BCN. My preference would be United Airlines of Star Alliance that could get good European connectivity through Spanair. Since I am the one making this suggestion, can I ask for a favor? Can you put a United flight from Boston to Barcelona on Friday evenings, leaving Logan at around 7pm and arriving in BCN around 8.30 am (Papa vine a recollir-me, arribo a dos quarts de nou!). Going back to First Class, still nothing like Virgin Atlantic’s Upper Class that I described in my post “I love Virgin”, neither masseuse nor manicure. In the last leg, I watched another comedy, you will hate me for this, but I loved it. The movie was Music and Lyrics with Hugh Grand and Drew Barrymore. I think it is created after the duet Wham, a kind of caricature. It is fun to see Hugh Grand dancing and Drew is really sweet and believe it or not I decided to see the version dubbed into American Spanish and this added to the charm (remember I am a non orthodox Catalan nationalist that supports trilingualism and actually likes the Spanish language, although I do not buy the Spanish Constitution). I attach a freshly googled video-clip of one of the songs Pop goes my heart, do not kill me, I find it fun. The Immigration and Naturalization Service (INS) loosely defines Hispanic as someone of any race whose ancestors were born in a country where Spanish is the official tongue. According to this definition, Brazilians, Portuguese and Andorrans are not Hispanic, but Catalans are. As minorities we supposedly have all kinds of advantages in what is called positive discrimination. Many Americans (and this includes governmental employees) still confuse race and ethnicity (even in the official forms) and think that all Hispanic are what ethnically is called mestizo, that is to say, a brown skin mixture of white and native American. But I have to tell you, I am a Catalan. Yes, I have a Spanish passport, but I am not Hispanic and I do not want to be. My mother tongue is Catalan and about my race, plain white. So, thank you very much, I do not need any positive discrimination, I do not want any help. Do you mean that if I had been raised in Spanish, I would be handicapped and I would need a favor? Absolutely disgusting! When asked, I always tell the truth, race: white (most probably a mixture of Celts, Iberians, Greeks, Romans, Franks, north European Barbarians with some drops of Arab and Jewish blood), nationality: Spanish (that’s what my passport says), ethnicity: Catalan. I assume that some of the federal agencies have put a working group together to find out what Catalan ethnicity is (OK, the reality is that Catalan ethnicity appears under Hispanic in the US census with the code 204). Luckily my color, my family name (Llorens) and my slight accent (Catalan, but most of the people confuse it with French or French Canadian) keep me off the Hispanic-targeted telemarketing campaigns. I see many people in USA who are very worried about Spanish taking over from English. Two months ago, the congress quickly put together a law declaring English the official language of the United States. Calm down, do not worry too much, the Spanish spoken on the streets of USA is terrible and it is getting worse and worse, as we speak. Phrases as: “Aplicar pa un trabajo” (Apply for a job), “Llámame p’atrás” (call me back), “El interé de tu mortgage”, make me sick. I cannot help it, I am a language purist. However the government does not seem to have any kind of remorse when using Spanish to recruit people for the military (I took the attached picture in my town, where the Hispanic population is close to zero). I have also observed another interesting phenomenon. When I talk in Spanish to people from South and Central America who live in USA, most of the times, they refuse to answer back in Spanish, even if they were talking in Spanish among themselves. Also very often, they switch to English when I get close by (by the way, most of them speak an American English 10 times better than mine). I dislike this attitude. Even if I do not consider myself Hispanic, I am proud to speak standard Castilian Spanish, and I would never switch language, just because a perceived Anglo is walking past. To summarize, I do not need any kind of discrimination, neither positive, not negative. Look at my green eyes and judge me for what I am. But if I need to identify myself, I will always proudly say, I AM A CATALAN. Due to my eclectic nature, I read (or browse through) 8 or 10 e-newspapers every day: e-noticies, Vilaweb, Raco Català, La Vanguardia, El Periódico , but also ABC, El Mundo, Las Provincias (Valencia) and a couple of international ones (Reuters, BBC, CNN, Haaretz and Le Monde). ABC always amazes me. When a Catalan does a something that they judge wrong, he is a Catalan, when a Catalan does something they judge positive, the person becomes a Spaniard. The latest example of that, is yesterday’s report on the latest list of best restaurants in the world (Restaurant magazine S. Pellegrino’s list). According to ABC’s report, El Bulli, owned by the SPANISH cook Ferrán Adriá or Adrià (apparently, ABC also wants to re-write the Catalan grammar, it should be Ferran Adrià, no matter where it shows up in the article) is for second consecutive year, the best restaurant in the world. According to the article, 6 SPANISH restaurants make it to the top 50 list. Good job Spain!! Oh! Surprise, surprise. There’s three Catalan and 3 Basque. However, the article does not mention, not even a single time the words Catalan or Basque. I understand, it is hard to tell, El Bulli, Mugaritz, Ferran, Berasategui, Can Fabes, Celler, Arzak, nothing closer to standard Castilian, at least for ABC.es. Anyway, Catalans and Basques, let’s not take this very seriously. Let’s not allow the single-sided, “Catalans-you-are Spanish-you-like-it-or-not-and-you-shut-up” approach of the Spanish nationalist media to cause us an indigestion. The only consequence I can get from the ABC.es article is that when we are independent, we will not starve. Let’s toast with “cava” and “txakoli”. El Bulli, propiedad del cocinero español Ferrán Adrià y situado cerca de la localidad gerundense de Rosas, sigue siendo por segundo año consecutivo el mejor restaurante del mundo, según la prestigiosa revista gastronómica Restaurant. Gracias al voto de la mayoría de los 651 jueces participantes, El Bulli consigue mantenerse en la primera posición de la lista San Pellegrino de los cincuenta mejores restaurantes del mundo que elabora esta revista, a la que España contribuye con otros cinco templos gastronómicos, ha informado hoy Restaurant. 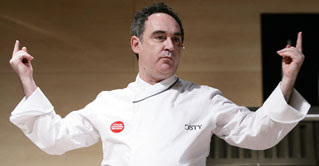 El Bulli, que en los últimos seis años no ha bajado del tercer puesto dentro de ese índice, ocupó el primer lugar en las ediciones de 2001 y 2006. Entre los elegidos de este año, y por detrás de El Bulli, los críticos de Restaurant han reconocido la labor gastronómica del restaurante Mugaritz, de Rentería (Guipúzcoa), que alcanza la séptima posición. De cerca le siguen el donostiarra Arzak y el gerundense El Celler de Can Roca, décimo y undécimo mejores restaurantes del mundo, respectivamente. El restaurante Can Fabes, de Sant Celoni (Barcelona), logra el vigésimo segundo lugar, mientras que el Martin Berasategui, de Lasarte (Guipúzcoa), alcanza el puesto veintisiete. Gracias a estas seis representaciones, España es el cuarto país, junto a Italia, con mayor número de restaurantes de alta cocina del mundo, superados por Francia, con doce; EEUU, con ocho, y el Reino Unido, con siete. El brasileño DOM, de São Paulo, en el puesto 38, es el único restaurante latinoamericano que logra hacerse un hueco en esta lista de los cincuenta mejores, en la que el año pasado ocupaba el último lugar. We, Catalans, cannot simply complain about the Spanish government not doing this or that to grant Catalonia the rights it deserves. It is also true, however, that so far nothing has been done to make of the Kingdom of Spain a place that Catalans (real Catalans, those Catalans from all origins who feel our culture, language and philosophy of life has a value) can call their country. Those who, like me, live overseas, know that in the Spanish consulates and embassies, there is absolutely no sign or indication that Spain is a multicultural, multilingual country. With a minimum investment, it would have been possible to have the key signage in Spanish and Catalan (most probably they should have had it also in Galician and Basque too), and in those locations where there is Catalan speaking personnel, a sticker on the counter saying: “es parla català”. It would have been a great gesture by the Spanish government to push to have Catalan recognized as an official language of the EU, based on the fact that is the EU language without state that has highest number of speakers and is used at all levels of society (education, communication, literature, business, etc.). It would have been easy to make the case, or otherwise refuse to pay for those languages that are not even exclusive of their countries and used by orders of magnitude less that Catalan, like Gaelic or Maltese. They could have supported the Catalan national teams in those sports where Catalonia is a world leader (roller hockey, waterpolo, ...), the same as Great Britain with soccer, rugby and others, instead of spending public money to avoid it. They could have favored multi-language labeling for products with distribution nation-wide. They could have included Catalan (and also Galician and Basque) as languages that can be used to represent Spain in any foreign cultural event (even the Eurovision, I do not think that by singing in Catalan, we would be worse off). They could have encouraged the use of the 4 national languages in Parliament, just by investing a little bit in interpreters, a small investment to show that they care. They could have fought to get the bullet train connection Valencia-Barcelona-Paris, far earlier than the Madrid-Seville. They could have pushed to get an international airport hub in Barcelona to support the “still now” leading economy in the Iberian peninsula. They could have used the traditional Catalan industrious and reserved character, to counter the Hispanic stereotype flamenco-party-fiesta-macho-ole that people outside Spain have in their minds. The could have endorsed the fact that Catalan and Valencian are the same language, something that is clear as water, but they never did it because they wanted on one side, to undermine the Catalan culture, and on the other side to score points with the Valencian Spanish nationalist. The scientific truth to hell if we get the majority in congress, that’s their approach. In the 70’s, for instance, the Belgian government issue a law that stated that Flemish and Dutch were the same language (Neederlands), something unthinkable in Spain. During the 30 years of democracy, I thought that there was hope for a federal monarchy, where Catalonia, its culture, language and personality would be valued. As per today, I have totally lost hope, especially today after watching a hate- speech program in Telemadrid. We need to go a different route. It is all in our hands, Catalans at home, in Europe and overseas. The biggest handicap is also within ourselves. The current Catalan politicians are a scam. I hope that one day, we will act united as Catalans and not in a partisan way. Before that happens, I have no hope. A non orthodox Catalan nationalist with degrees in engineering and business administration. Local and, at the same time, universal. My secret wish is to become, one day, a catalonIAN politicIAN.